Over four million visitors enjoyed Yellowstone in 2015! 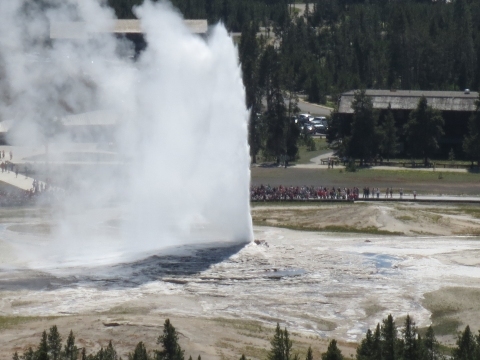 Comments Off on Over four million visitors enjoyed Yellowstone in 2015! 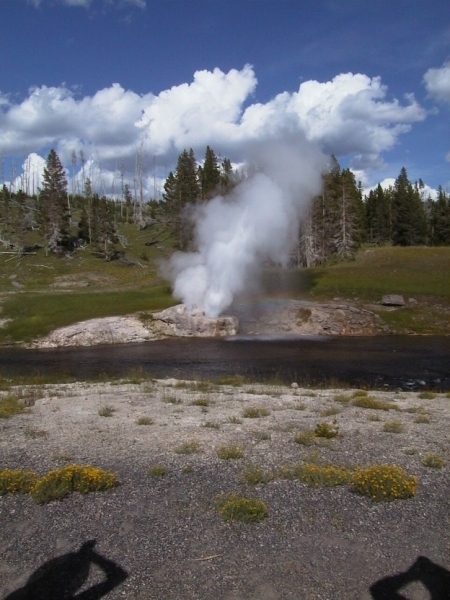 The National Park Service has announced that Yellowstone Park has just had another record year. Nearly 600,000 more people passed through the park’s five entrances in 2015 than in 2014, a total of 4,097,210. As always, the West Entrance was the most popular, and more people visited in July than in any other month, with August and June just behind in numbers. The NPS attributes this year’s popularity to lower gas prices, stepped-up marketing by Montana and Wyoming tourist bureaus, and the NPS’s own “Find Your Park” program. In addition, beginning last year, to encourage visitation, all families that have a fourth grade student may enter any national park without paying an entrance fee. To open the event, University of California Chancellor Nicholas Dirks gave a brief address. The panel’s moderator was Michael Krasny, a familiar voice to listeners to San Francisco’s public radio station KQED as host of the station’s morning Forum program. In addition to Jewell, the other two panelists were Janet Napolitano, formerly Secretary of Homeland Security and now president of the University of California, and history professor Douglas Brinkley of Rice University, the author or co-author of some 23 books relating to American history. The entire evening’s event was videotaped and can be accessed at: parksforscience.berkeley.edu. 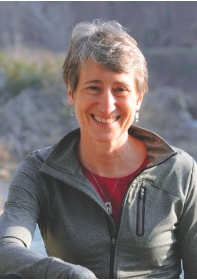 Secretary Jewell was born in London, England, but her family immigrated to Seattle, where she received a mechanical engineering degree from the University of Washington. She and her engineer husband have two children. After working in petroleum engineering and then in banking for many years, she became a board member of Recreational Equipment Inc. (REI) and then its chief operating officer. She’s an outdoor enthusiast herself, having climbed Mt. Rainier several times. Listening to Ms. Jewell talk about her work at Interior, we can feel that the department is in very good hands. In fact, her co-panelist, historian Brinkley, pointed out that since the creation of her department in 1849, the work she has done there in less than two years compares well with that of Harold Ickes under President Roosevelt (Interior Secretary from 1933 to 1945) and of Stewart Udall (1961 to 1969) under Presidents Kennedy and Johnson. Already in place, another program called the Youth Initiative has begun in 50 cities with the participation of YMCAs and funding from American Express. The program was launched last year “to bridge the growing discontent between young people and the great outdoors” with goals to help children play, learn, serve, and work in outdoor spaces. Jewell cited one unit of the program’s launch, where Miami children learned to dissect small fish in nearby Biscayne National Park. This program will take place in some of the more than 75 urban national parks and other refuges and on Bureau of Land Management (BLM) recreational lands. Asked about the role of technology in the parks, she suggested that cell phones can (and in some places already do) give out local information in the voices of people who live nearby, and tech companies (or perhaps even REI!) could develop games involving plants, animals, or invasive species. 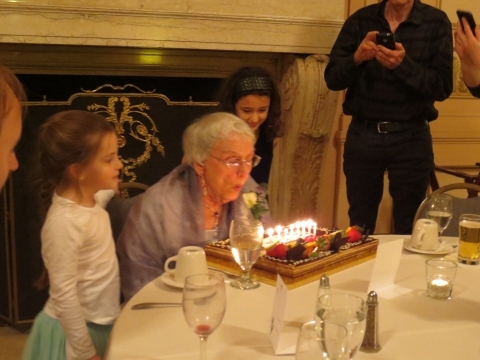 As she brought up the water fights in drought-stricken California, Jewell insisted that the parties must get together, stop talking over and around the subject, and solve the problems by finding common ground. 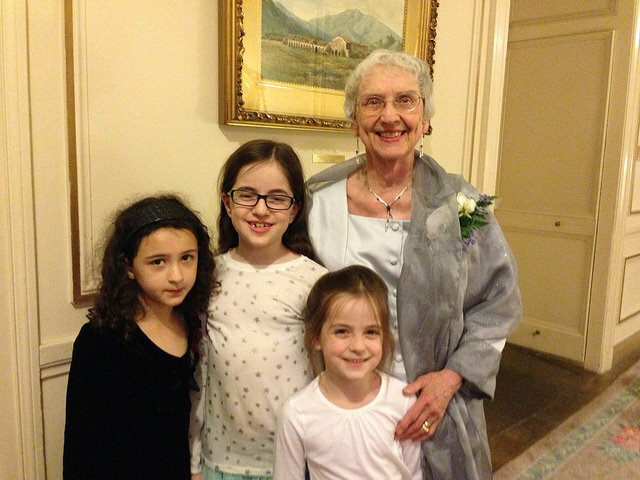 “It’s hard to let go of the ‘from’ if you don’t know what the ‘to’ is,” she told us. During the summers of 1940, 1941, and 1942, we stayed in a room in the bunkhouse. 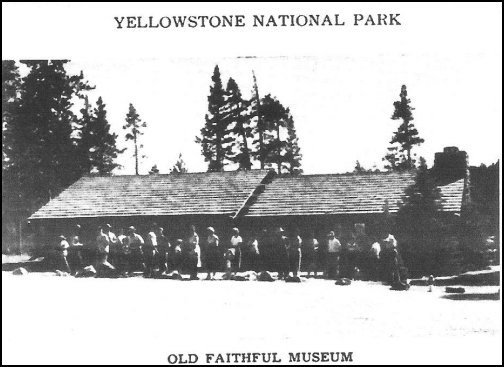 It was a long, narrow building divided into small rooms that primarily housed bus drivers for the Yellowstone Park Company. In our room, which, I think, had a window alongside the door, there was just room for two double beds, one or two chairs, and a small table with a wash basin and a cooking element, where Mother improvised meals for three, since Daddy ate with the other employees. A chamber pot was kept under one bed. I believe we had two such rooms one of those years. The bunkhouse was located behind the ranger station and away from the back door of the Inn, an area now part of the big west parking lot. I was happy to find the exact location on an old map, since the bunkhouse would have been torn down long ago. I snapped this photo of the map during Lee Whittlesey’s June 2006 Southern Park History class. Some of my most vivid memories center around the Inn. We spent relatively little time inside the lobby. In fact, I believe Mother made sure we were never in the way of the tourists or the Inn employees. But I remember that occasionally a bellhop would pop some corn in an oversized corn popper in the lobby’s huge stone fireplace. A few times during our summers in the park we were taken up the many stairs to the top of the lobby and out to the roof. I remember the many flags always snapping in the wind and the unique two-person wicker chairs, shaped like an S. From the roof I saw an Old Faithful Geyser nighttime eruption lit by a spotlight a few times, but that was usually too late for us little ones to stay up. It was thrilling to see. Partner writing desk on an Old Faithful Inn balcony. Another thing that made a big impression on me was the unique style of the balcony desks. Joan and I would often sit at these and play–or perhaps she would read to me by the light of the center lamp. The desks there now are not the originals designed by Robert Reamer, but they are very similar to those I remember. Sometimes we would watch Daddy as he got out his large red megaphone and called out the names of people who were to ride in the big yellow buses. I remember feeling that he was a very important person indeed with that responsibility. Returning to the Inn many years later, I realized that the area around Daddy’s transportation office had been changed. Where you now find a large window and the porters’ stand was a door to the back of the Inn and the place where we could find Daddy during working hours. More from Janet’s memoirs in the next post in this series . . . .
CREDIT: The photo of the partner writing desk is by Leslie Kilduff. You can find it on page 77 of Yellowstone Treasures, fourth edition. Many of the national parks have a program that allows children ages 5-12 to become junior rangers by jotting down the animals and features they see in an activity book and attending ranger talks and walks. 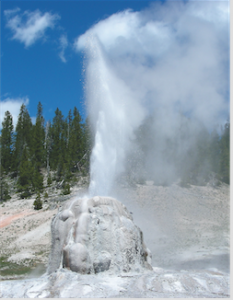 Now Yellowstone has just published a new one.